I can fairly well remember my first experience as a child visiting the dentist. Like the experience for most kids, mine held the potential to be a traumatizing event. He was an older, unfamiliar man who seemed way too anxious about becoming my friend. He placed me in this strange, inclining, mechanical chair with straps on it. How could a little kid think of anything other than Frankenstein? Then this man I didn’t know who smiled at me way too widely, who now wore a bizarre green gown and a surgical mask, shown a tremendously bright light into my eyes, pried open my mouth and squinted oddly to peer profoundly into my oral cavity. His peering had obviously not satisfied his curiosity because he continued to poke and prod in and out of every crevice with sharp metal instruments, relics of torturing tools from the Inquisition. If anyone ever wished to publish a manual on how to traumatize a kid, they would simply accurately describe a first visit to a dentist. Yet, I wasn’t traumatized. In fact, I don’t even remember any of the business end of the visit to the dentist. Still, I do remember it. What did I remember? Why wasn’t I traumatized? Dinosaurs. After the exam and perhaps a quick brushing (I didn’t have any cavities and thus was spared the true horror of a whizzing drill), the dentist lead me, my mother in tow, to a small supply room. There, displayed on a counter at about my eye level, were herding, plastic (actually probably rubber since it was the 60’s), green, red, blue, and yellow dinosaurs. They were only about one and a half inches tall, but they were mesmerizing. Then the dentist said a truly magic word. “Pick one.” Whatever maniacal experiment this deranged man had performed on me had been worth it, because I had hit the mother lode of prizes, my own dinosaur. Though I should have been traumatized by such a foreign, terrifying event, I wasn’t. The principal part of the visit, picking out my personal dinosaur, far overshadowed the otherwise haunting, intrusive nature of having someone stare into your mouth. I remembered the dinosaurs, and the brilliance of my first dentist, just yesterday in a most unlikely, and yet again, foreign environment. 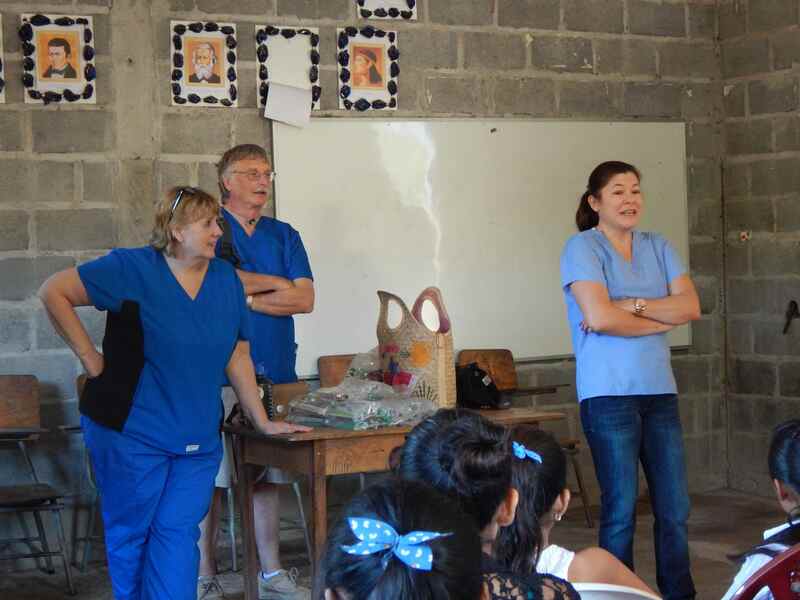 We followed the dental brigade to the small village of El Cerrón. Though it is still vacation until February 2, the kids from the village met them at the small schoolhouse. The school is already enrolled in Shoulder to Shoulder’s school dental program. Most of them know the importance of brushing and the dangers of gluttonous consumption of sweets and junk food. They also get fluoride treatments and trips to the dental clinic when they need work. 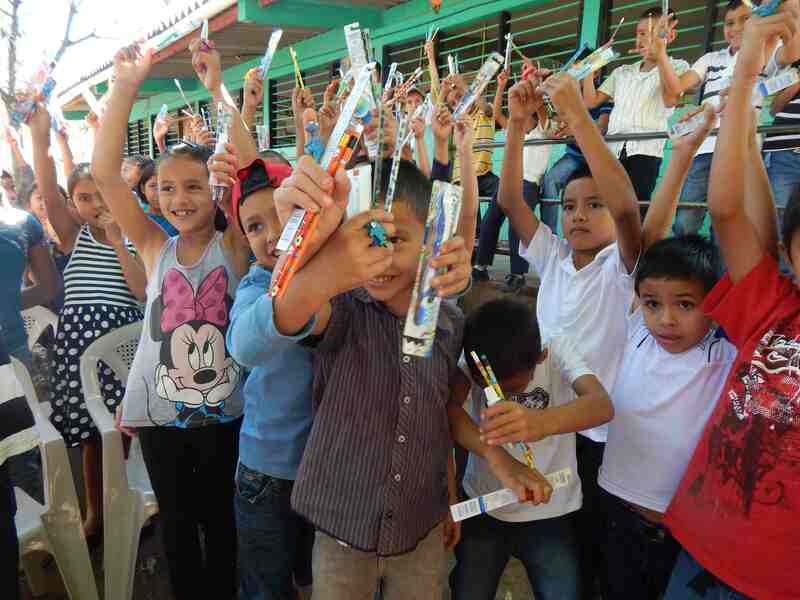 Even so, here in Honduras where dental disease from poor dental hygiene is an epidemic, the message can’t be repeated often enough. In any case, the boys all had rings on their fingers; little plastic rings that I assumed were gifts from the dental brigade. Then I noticed one boy playing with another boy, poking his ring at the other boy’s ring. I focused to see the two plastic, ring dinosaurs engaged in mortal combat. I laughed audibly. Though you may think otherwise, things have not changed that much in forty-five years. Closer scrutiny made me realize that some of the rings featured dolphins as well, and the girls had stick-on jewelry proudly attached to their bodies. When it came time for the kids to line up for their exam, when these very tall, very foreign people with bright flashlights wanted to poke around inside their mouths, the children showed no hesitancy, but rather raced to be first in line. It really is easy to help others. It really is easy to communicate healthy habits to others. It really is easy to reach out across culture divides, to overcome the fear derived by the response to what is foreign by celebrating the joy discovered in what is shared. We do great things here at Shoulder to Shoulder, miraculous things, tear-jerking heroic things. Our brigades come down because they want to be part of it, and they are. They do miraculous things. We are proud of our and their achievements as we should be. Still it is sometimes the littlest things we do, the things most people wouldn’t notice or remember, that are the most powerful. Someone thought enough to bring dinosaurs, dolphins, and stick-on costume jewelry. Maybe even they didn’t think it would be that important, given all the heroic acts they would be involved in. 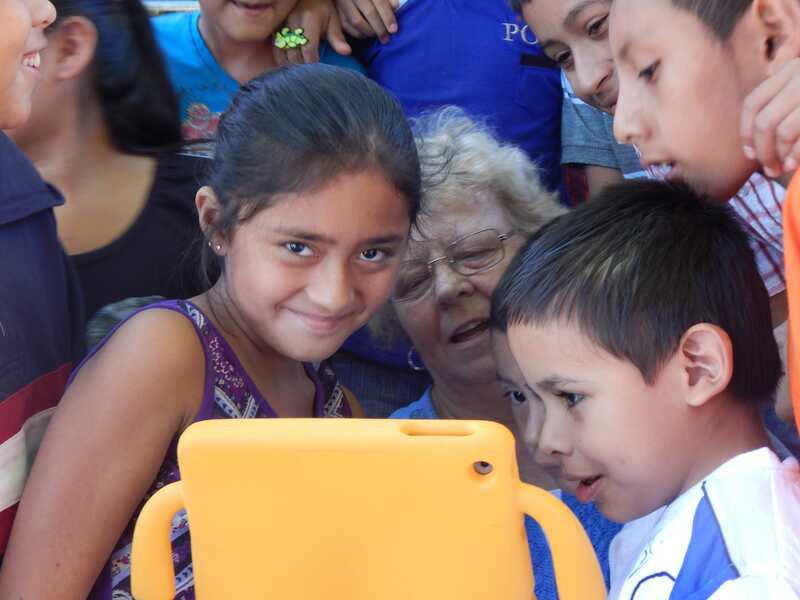 But forty-five years from now, one of those kids from the small schoolhouse in El Cerrón might remember the magic of a dinosaur. Truly miraculous! !